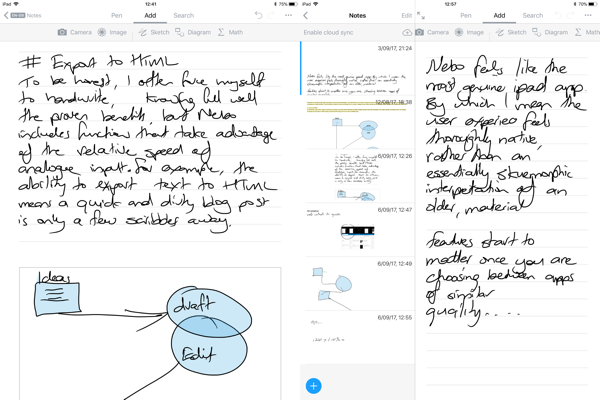 Not too long ago, I wrote about handwritten note taking on the iPad. At the time I hadn’t yet spent much time with Myscript Nebo, but having since addressed that I feel it is appropriate to update the ledger. One of the caveats I put in front of that previous effort was the ability to take long form notes without the need of an Apple Pencil, so if you are looking at options for taking notes on the standard iPad, or you simply want to avoid the further cost of the Pencil, then what I the previous post still holds. For handwriting without the Apple Pencil, to my mind the best two options are still GoodNotes and Notability, and I have briefly covered the various tradeoffs users face with both apps. Both of those apps also have excellent Apple Pencil support, but having played with Nebo some more, to my mind there is no contest when it comes to handwriting recognition. People like to talk about killer apps, personally I don’t much like the phrase, but where Nebo is concerned, it really does seem like a killer for the competition. Apps like Notes Plus have been available in the App Store for some time, but while that might have led to advancements in the inking engines and textual recognition, those improvements are more often than not accompanied by either feature bloat, user interface baggage, or both. 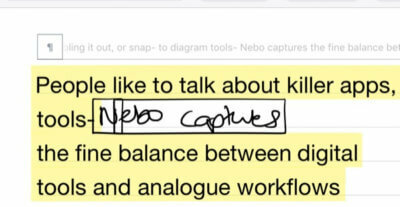 This is one of the areas that Nebo excels, the interface is minimalist without being too sparse, and rather than holding to the now dated skeuomorphic design philosophy that once ruled the iOS-sphere, Myscript have managed to tastefully incorporate hybrid analogue elements that remain necessary for a successful handwriting workflow. Writing between the lines is as helpful to your wonky adult scribbles as it was to your long-forgetten spelling homework. It is not only the user interface that benefits from such careful balance, but the user experience is characterised by clever gestures that complement a natural writing workflow. With Pencil gestures a user can delete a word by scribbling it out, insert line breaks, join and seperate words with simple upward and downward strokes. Framing words, highlighting, underlining and a variety of bullets enable simple but effective formatting that not only stops short of overkill, but is simple to learn. The most impressive aspect of these formatting gestures is the resulting seamless workflow that avoids interrupting one’s note-taking on input. The one area that the Pencil-centric interface can get a little tricky is in editing text after capture. Nebo’s handwriting recognition works in real-time, so if necessary you can make corrections on the fly . If you happen to overlook a mistake until you have confirmed the conversion from handwriting into text, editing is still managed with the Apple Pencil. This is a reversal of the analogue to digital workflow, so while it is not difficult as such, I have to admit it takes a little getting used to. Regardless, Nebo still manages to capture the fine balance between a digital tool and an analogue workflow, something I feel other apps have come close to doing without quite getting there. At the risk of being hypocritical, there are things that Nebo cannot do that I like to have in a notes app. I confess to hypocrisy for a couple of reasons, for one I have something of an old-skool reverence for what is known as the Unix philosophy, which simply stated is ‘do one thing and do it well’. It seems to me that – whether intentional or not – by design, iOS is almost the ideal realisation of this modular approach. Nebo is exactly this kind of app, it does one thing, and it does it exceptionally well. However, defining the boundaries of that one thing is what developers have to contend with in balancing the features they include, and support in their apps. The decision that I find most confounding in Nebo is the inability to annotate PDF documents, which I feel is made more conspicuous in its absence by the fact that you can import images for markup, and you can export text as PDF. This is no more than a minor quibble, and as I say, a somewhat hypocritical one at that. To be honest, I often force myself to handwrite, knowing full well the proven benefits. Fortunately, Nebo has some tricks that take advantage of the relative speed of analogue input, making it a more obvious choice for certain tasks. For example, the ability to export text to HTML means a quick and dirty blog post is only a few scribbles away. 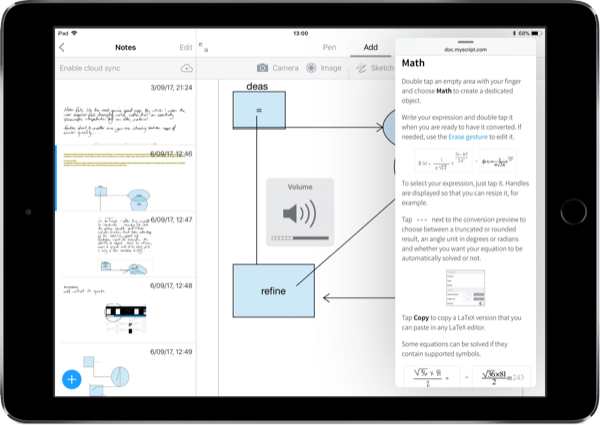 Dedicated math objects can perform solvable operations – and the resultant text can be converted for further editing in any LaTeX editor . I would ordinarily open up Soulver for simple calculations, but that is not always necessary now. Nebo will also turn your ropey diagrams into congruent shapes for flow charts and mind maps. And, of course, optical character recognition means all of your text is searchable. Nebo is not perfect, but there is no doubt that Myscript have pushed the envelope with handwriting recognition. If you have an iPad Pro, I would almost go as far to say that Nebo is enough to make picking up an Apple Pencil worth your while.